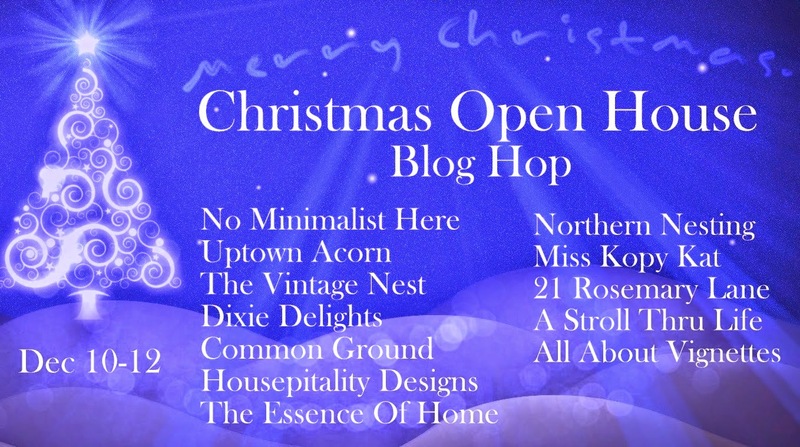 No Minimalist Here for including me in her Christmas Blog Hop...I was honored to be included in all the fun! Come on in out of the cold and have a look around! Today we're taking a tour of my entry dressed with Christmas cheer! I love this flat basket I picked up at the Country Living Fair...I will definitely be on the hunt for another one at next years fair! I tucked a piece burlap ribbon in...then added greens and red berry picks...simple and pretty! I just changed out the original ribbon with a piece of this burlap one. I found these cute bells in Home Goods this year...love the feathers on them! Can you tell red poinsettias are my favorite! Hope you enjoyed the tour of my entry! I'm a red Poinsettia gal as well. Your foyer looks so pretty! I like how you styled that wall basket. I have that same one so its good to get ideas on other ways to use it. Beautiful Martina...love the basket you purchased at the CL Fair...the foyer is so beautifully decorated of for the Holidays and gives your friends and family a very warm and festive welcome....great partying with you! Such a welcoming foyer, Martina. I love it all and I couldn't help but notice your collection of canes...love. And might I add your wood floors look fantastic, especially for a high traffic area. Your entry is very welcoming and pretty in all of it's Christmas finery! I do love that flat basket. Festive and cozy Martina-I love the basket with the berries! HI Martina! Your entry is just so pretty all dressed up for Christmas. Love that basket and your little floral on the door. Christmas is almost here. Gorgeous, everything is so pretty and so welcoming. I love the wreath on the door and the Merry Christmas above. I am drooling over the canes too. What a beautiful way to welcome your family and friends. So festive and welcoming. I love the flat basket too. xoox I have an obsession with baskets. So pretty and festive! I adore the wall basket filled with greenery and red berries! Martina, Your entry is so pretty! I love the basket you got at the CL fair. Thanks so much for joining the blog hop and Happy Holidays to you and your family. love your adorable Santa surrounded by the frame, and the vines and twigs all lit up around your door! just beautiful, Martina! Your entry hall looks so festive and welcoming, Martina! Love the last shot outside with the lights around the door. Martina in a word...gorgeous!!! Your entry is so festive and cheerful. I love your pops of red and that grapevine garland around the front door with the lights is simply stunning! You are certainly ready for Christmas!!! Your outdoors with your welcoming front door looks fantastic! I also love baskets on the wall. Lends such pretty texture. Pretty and perfect, Martina. I bet your friends and family will love it when they walk in the door. Your entryway is so pretty! It's really warm & welcoming! So pretty! How did you attach the Santa to the mirror? I love the way that you did your ribbon Martina. Everything looks so welcoming! Very pretty, Martina. Festive and fun! I love your Christmas entryway. I have never thought of decorating the inside of my front door and now after seeing yours I'm inspired! Hi Martina, love your entry. It's so welcoming and inviting. I love the grapevine with the lights around the door. I love decorating the inside of the door too. Yours is gorgeous. Sweet lighted snowman too and those feather bells are darling. Just wanna say that your home looks great with all the christmas decorations.Wish you a wonderful weekend ! Beautifully done Martina! Love each detailing including the outside! Very pretty ~ I love that basket on the wall too especially with the burlap ribbon and that little santa by your door is too cute! Beautiful, Martina! Love, love the wall basket! Beautiful entry! Thanks for sharing, Martina. Happy Holidays! Martina, your entry and your home are gorgeous. I love the burlap ribbon and the pops of red. danke für die wunderschönen inspirationen, liebe grüße von angie und einen schönen freitag!!! Martina love the bells from Home Goods. I haven't been there at all. It has been constant in this house since we moved in. Your entry looks so cute decorated for the holiday!! Martina, your entry looks pretty and festive. Love that flat basket and how you filled it! I've been enjoying all of your Christmas vignettes, decorations, and collections, Martina. Everything is beautiful! Your foyer looks lovely. Love the basket filled with greens and the burlap ribbon.